In the world of cancer drug discovery, the Ras family of G proteins – K-Ras, H-Ras and N-Ras – is a so-far unclaimed prize. Given that a third of all tumors have mutations in a RAS protein, with mutation rates in certain intractable cancer types such as pancreatic cancer topping 90%, that’s not for lack of trying. But until recently, several decades of attempts to shut K-Ras – which is the black sheep of the RAS family, having the worst effect in terms of tumor growth – down have yielded no success. K-Ras has required a reputation for being ‘undruggable’ in some circles. Ras is a GTPase, meaning that when it is activated, it binds GTP, which activates growth signaling pathways in the cell, and hydrolyzes it to GDP. That GDP is then released, which turns K-Ras back off. That, of course, was something of a rhetorical question. “I believe that targeting Ras proteins directly, and K-Ras cancers, is possible,” session speaker Frank McCormick told the audience. One of the problems with targeting K-Ras may be that little data exists on what goes wrong structurally when RAS is mutated. Ras is in principle able to hydrolyze GTP without any further help, but the reaction proceeds very slowly. So in practice, for GTP-bound Ras to be turned back off, it needs to bind an additional protein, a Ras-GTPase-activating protein-RAS or Ras-GAP. Several different proteins exist that can greatly speed up the reaction converting GTP to GDP, turning Ras back off. Mutant K-Ras is unable to break down GTP and so gets stuck in the on state. One reason can be that there is a steric clash between GAP-Ras and the mutated version of the protein. At his talk, McCormick described a Ras-GAP with an “arginine finger” which pokes into active site of K-Ras, setting it up for GTP hydrolysis. At least one Ras mutation leads to a steric clash – the substitution of a valine for a glycine at position 12 changes the shape of the active site so that Ras-GAP’s arginine can no longer fit. Indeed, several groups have reported novel structural insights into Ras in recent years, identifying binding sites that could serve as druggable parts of K-Ras. In 2012, two separate groups of scientists identified binding pockets that could be used to target K-Ras directly. Both were located near the “switch” regions of K-Ras, where the important conformational changes occur when K-Ras binds GTP. Both those pockets were comparatively shallow, and so whether they can be utilized therapeutically remains to be seen. In 2013, scientists also managed to identify a third binding pocket that is present in one specific type of K-Ras mutation – the G12C mutation – in which a cysteine takes the place of a glycine, a mutation which is relatively frequent in lung cancer, because it is a direct consequence of exposure to tobacco smoke. 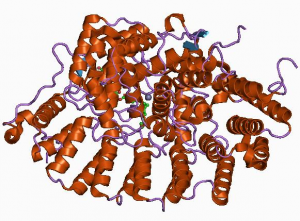 The team was also able to develop inhibitors for this specific mutation that changed K-Ras’ binding preference from GTP to GDP, though the inhibitors reported to date would not be suitable for clinical use. Some researchers have tried to target Ras indirectly. There are a number of clinical programs targeting proteins, such as PI3 kinase Mek, Erk, and RAF in the growth-promoting pathways that Ras activates, while RAF inhibitor Zelboraf is approved for the treatment of metastatic melanoma. Another possibility may be to prevent the interaction of Ras with proteins that are necessary for Ras to attach itself to the cell membrane, which is where it gets activated by extracellular signals. The first wave of such treatments, targeting the enzyme farnesyl transferase, has been unsuccessful, because another enzyme takes over when farnesyl transferase is inhibited. An alternative method, competing with Ras for binding to its membrane docking protein, is in clinical trials. And in 2013, researchers identified PDE delta as a protein that helps control the cellular localization of Ras, and whose inhibition sent the protein to internal membranes rather than the cell membrane, blocking its activation and signaling. McCormick and his team are working to develop a one-stop shop for Ras researchers, or what they term “A Collaboratory for RASologists,” in the web site Rascentral.